So we've created a unique solution that gives you individual tone controls for each pickup along with a master volume control. Now you can adjust the tone separately for each pickup exactly as you see fit for your particular needs and playing style. With this unique custom built pickguard assembly we've incorporated our very own implementation of 4 recessed mini-toggle switches. By utilizing Seymour Duncan's tapped pickup sets, three of these switches toggle each of the three pickups between a tapped output level (lower output) or full output, each pickup has it's own switch for its output level. This gives you a wide range of tonal versatility, it's like having two completely different sets of pickups in one guitar. The fourth switch is for activating the neck pickup in conjunction with the bridge pickup or for activating all 3 pickups at once. You'll still have the typical 5-way selector switch for your normal pickup selections, it's just that with each pickup being tapped and selectable is what gives you the pickup selection versatility. There are a total of 26 different and unique pickup selections to choose from. Pickup set selection options are from the tapped versions that Seymour Duncan offers; SSL-3, SSL-4 and SSL-5. The middle pickup will be Rw/Rp (reverse wound, reverse polarity) for hum cancelling when the 5-way selector switch is in positions 2 and 4. The SSL-3 and the SSL-4 have flat pole pieces and the SSL-5 has staggered height pole pieces. 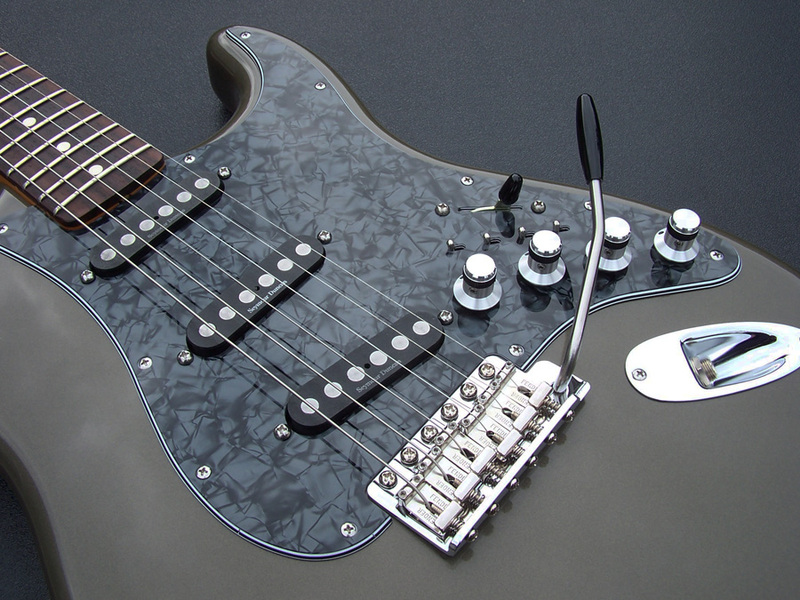 Here is a link to an article written in the official Seymour Duncan's blog about coil tapping or tapped pickups http://www.seymourduncan.com/blog/tips-and-tricks/what-is-coil-tapping/. Each tone control potentiometer has it's own polyester film Orange Drop tone capacitor so you can select which value of capacitor you feel is best for each pickup position. Here is a link to a very informative video that explains How Tone Capacitors Work and is well worth watching to fully understand how tone capacitors effect your tone and to help you make an informed decision for the tone capacitor selection in your pickguard assembly. Control knobs are custom manufactured machined aluminum as depicted in the photographs below. Potentiometers are manufactured by Bourns and will have a 1/4" solid shaft. These potentiometers have the smaller 17mm case diameter which is required for this particular 4 control design due to space constraints. If you select the SSL-4 (Quarter Pound) pickups they will not have plastic pickup covers installed, these pickup only come as depicted in the photographs below and only in black and will have "Seymour Duncan" imprinted on the top. Due to the larger pole pieces (1/4") plastic pickup covers are not available for the SSL-4 pickup sets. Accessory colors are available in White, Parchment, Aged White and Black. The accessories will consist of the pickup covers and switch tip. If you select the SSL-4 pickups then the pickups will not accept the plastic covers and will be black as described above and the accessory color will be selected for color of the selector switch tip. We offer 24 different pickguards to choose from in either the standard 11 hole or vintage 8 hole mounting pattern. Below is a chart of all the available pickguard colors and patterns. Click on any of the small images below to display a representative image of the pickguard and it's edge characteristic (ply or layers). Complete guitar shown for illustrations purposes only, product availability will be for the complete and fully loaded pickguard assemblies that will be ready to drop into your favorite Strat. 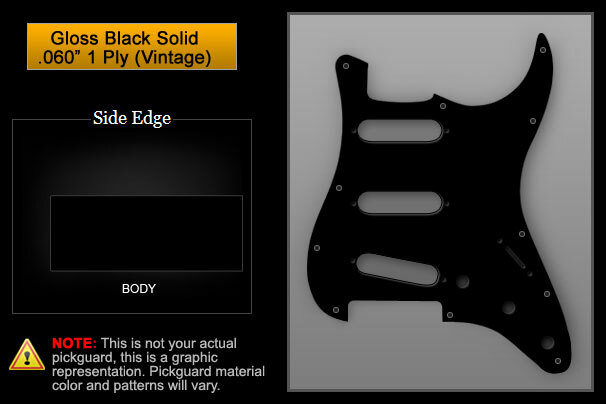 If you have any questions about this pickguard assembly send us an email. Click on the thumbnail images below to display an illustration of the pickguard on the right. All pickguards are custom ordered from Warmoth Custom Guitar Parts at the time of your purchase, so there is an approximate 7 day lead time from order placement until we receive your pickguard. 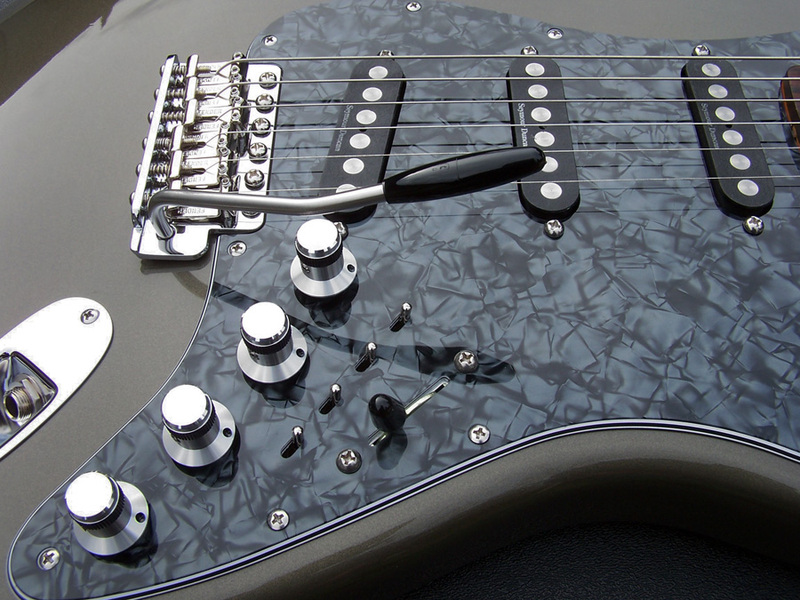 When your pickguard is received from Warmoth we will begin the customization of the pickguard, manufacture the 4 recessed mini-toggle switch mounting bracket system and start the assembly process. On average we should be able to provide a 21 day or less turnaround time from order placement until your order is ready to ship. Warmoth is able to provide us with custom pickguards that allows us to further customize it for the 4 potentiometer controls and the 4 recessed mini-toggle switch slots for this unique assembly. Since the pickguards for this project will need 4 holes for the volume and tone potentiometers and all standard pickguards already have three which won't work. Warmoth is able to omit the middle potentiometer hole which allows us to further customize the pickguard with the two in-between holes for the neck and middle tone potentiometer controls. All pickguards arrive from Warmoth Guitars with aluminum foil shielding in the control region only, so if you want it fully shielded with a matching customized version of the '62 style aluminum shielding plate you must select this option at the time of purchase. This customized aluminum shielding plate is 0.012" thick and is installed on the back side of the pickguard, this is the same way Fender® does it on all of it's '62 style pickguard assemblies. Our custom aluminum shielding plate is modified to accommodate the 4 controls, the 4 recessed mini-toggle switches and the modern 11 hole mounting pattern. Bridge Pickup: Seymour Duncan SSL-3 (Hot, Flat) Seymour Duncan SSL-4 (Quarter Pound, Flat) Seymour Duncan SSL-5 (Custom, Staggered) All pickups are tapped for dual output switching. Middle Pickup: Seymour Duncan SSL-3 Rw/Rp (Hot, Flat) Seymour Duncan SSL-4 Rw/Rp (Quarter Pound, Flat) Seymour Duncan SSL-5 Rw/Rp (Custom, Staggered) All pickups are tapped for dual output switching. Neck Pickup: Seymour Duncan SSL-3 (Hot, Flat) Seymour Duncan SSL-4 (Quarter Pound, Flat) Seymour Duncan SSL-5 (Custom, Staggered) All pickups are tapped for dual output switching. 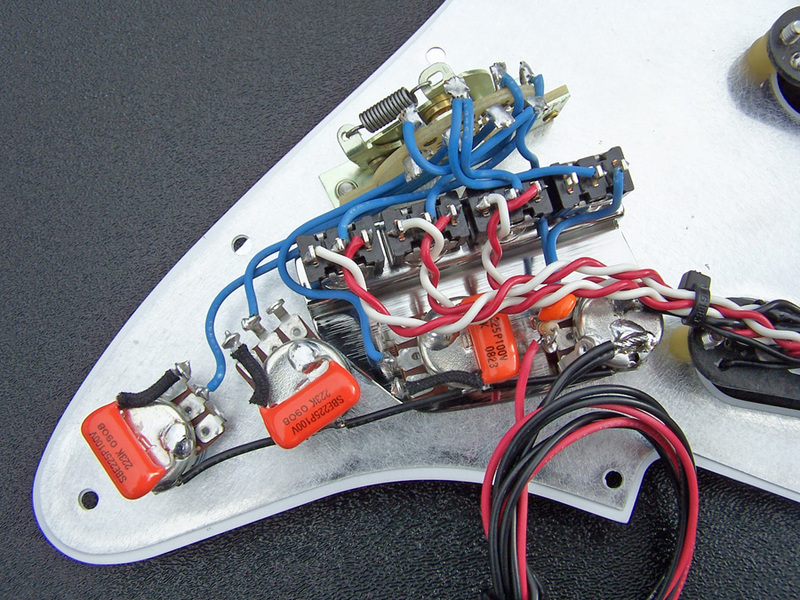 Use the following Add On options for upgrades to the standard pickguard assembly package. IMPORTANT: All custom built pickguard assemblies are not returnable, refundable or exchangeable due to the unique nature of the customized options you select for your particular assembly. 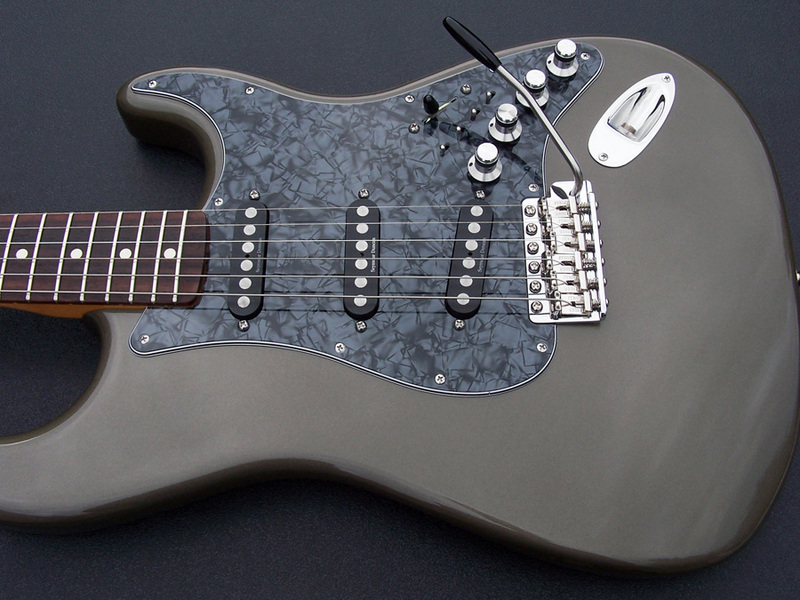 Each pickguard assembly is custom built on an “As Ordered” basis for each individual customer with their specific and unique assembly options selected at the time of purchase. All pickguard assemblies are completely tested before shipment to ensure correct operation, so if you’re having a problem please re-assess everything you have done during the installation process to see what might of went wrong. Complete guitar shown for illustrations purposes only, product availability will be for the complete and fully loaded pickguard assembly. Pickguard shown is the Black Pearl. Pickup set installed is the SSL-4 set along with the custom machined aluminum control knobs. Complete guitar shown for illustrations purposes only, product availability will be for the complete and fully loaded pickguard assembly. Close-up detail of the custom machined aluminum control knobs and the 4 recessed mini-toggle switches. Close-up detail of the control electronics. CRL USA 5-way selector switch. Four SPDT mini-toggle switches; each tapped pickup has it's own mini-toggle switch to select it at a either the tapped or lower output level or full output level. Also a single SPDT switch to provide you with two extra pickup selections you don't normally have with the 5-way switch which will give you the bridge and neck pickup selected together or all three pickups selected at once. Four Bourns PDB181 series 17mm 250k audio taper potentiometers controlling the tone and volume. Each pickup has it's own tone control along with a master volume control.